Jamie Olive is my hero. Last year, when he came to the United States and make a debut in the small, sleepy town in West Virginia, he clearly made an impact and difference in their lives. This year, he might have taken on more than he could chew by tackling the enormous Los Angeles Community. By the end of the last show, though, he gained the support of the new supertindent of the LA School system. He’s got the right ideas though. He wears his heart on his sleeve and is aiming to put things into good perspective with good eats, starting in the schools. I thank him for his perseverance in keeping on the school systems. I look forward to see the long range effects of his efforts. What’s next for this hero? Can’t wait to see what he’s got up his sleeve for the next leg of his crusade! News | Jamie Oliver (US). $31,244 is the average income of 90% of the income earners, which has only seen a change of 1% during 1970-2008. As you climb the chart to see other ranges of earnings, the population gets smaller and smaller, but the change of income earned during this same time frame is increasing higher and higher. Something is very wrong with this picture. How are folks supposed to hold on to hope for economic change in the future, if 90% of the population is seeing the littlest of changes? via (Not) spreading the wealth – The Washington Post. Oh, my! I just can’t believe that it has come down to discussing politician’s many love lives and infidelities, and let that drama get in way of what is truly underlying on the the important aspects of getting us out of this economic “bliss” and recession. Don’t get me wrong — when we vote a politician into office, we do hope and pray that they enstill the same morals and beliefs that are representative of our society as a whole, but let us not forget where our priorities should be. Can we please get down to the real business essential to our lives. I, honestly, cannot remember if this was also circulated around last year or not in our emails as well; whatever the case though, it certainly would bear repeating….enjoy!! then thesure sound of footsteps outside in the snow. PLEASE, Would you do me the kind favor of sending this to as many people as you can? Christmas will be coming soon and some credit is due to our U.S. service men and women for our being able to celebrate these festivities. Let’s try in this small way to pay a tiny bit of what we owe. Make people stop and think of our heroes, living and dead, who sacrificed themselves for us. “… Of course, nobody can steal your personal faith; that’s between you and God. The problem is in the political arena, where strident voices claim to represent Christians when they clearly don’t speak for most of us. It’s time to take back our faith in the public square, especially in a time when a more authentic social witness is desperately needed. It is indeed time to take back our faith. The whole sordid controversy shouldn’t even be there. True. Americans pride themselves on the premise of the separation of the State and Church, but just because a politician expresses themselves based on their religious beliefs as a human being and an American themselves, doesn’t mean that they are trying to mix the politics with religion. That would be taking the context of the separation of Church and State out of context and twisting it into an issue that shouldn’t exist. What they are referring to with the mix of Church and State is, for example, while the Catholic Church may take a stance of being against abortions, it doesn’t mean that the Government of the United States must also take a stance of being against abortions just because the Catholic Church may say so. There isn’t anything meant further by wishing one a “Merry Christmas” or “Happy Chanukah” to someone, even if they are in politics, other than expressing the greetings which have become a part of the celebration of the holidays representated by the beliefs in the culture of their religions. Okay, so I have digressed a bit. 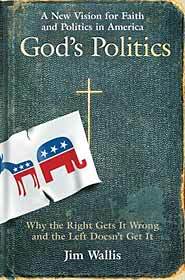 At any rate, from the excerpt above from Jim Wallis’ book on God Politics, it seems that there is a movement to understand the religious perspectives on social changes or social justices in the world and the mingling of a coming to a better understanding what the beliefs are through a “taking back our faith” process. It would be interesting to read the book in full and see Jim Wallis’ viewpoint on this issue. Have you read this book yet???? What do you think???? It is such a shame that folks have to be intimidated by expressing a simple greeting based on their religious belief. Gone are the days in many countries that many have to hide the Bibles as a symbol of their quest for knowledge based in the Christian beliefs; why should the United States be so much in a uproar over a simple greeting — especially when the vast majority of the citizens of the United States have a founding belief based in some form of Christianity belief system. “The need of the moment is not one religion, but mutual respect and tolerance of the devotees of the different religions. Ouch! Could a reviewer of a biography be any harsher on an author?? “The subtitle of Elizabeth Bumiller’s biography “Condoleezza Rice: An American Life” tells you everything you need to know. The book is serious, sober and deeply unimaginative. OMG! Do you think Mr. Taylor had an opinion on this, or what? While I have not had the opportunity to read the book on Condoleeza Rice, I would love to see what it might have to say about this very stately woman that seems to have a good head on her shoulders with the utmost diplomacy. I am not sure that a book on this woman could have been with a steaming richness like a torid romance novel or suspence/mystery book since this woman has seemingly staved away from huge controversial areas, other than working with President George W. Bush’s presidental era. Although I have no idea about this author and her methodology of her writing skills, I feel that certainly Mr. Taylor may have been a little too harsh – especially in observing the diplomatic nature of Ms. Condoleeza Rice in her own right. However, perhaps, I should get the book and see whether or not I can concur with Mr. Taylor. Have you read this book yet? Do you have an opinion?? ?